Your wedding stationery list can be as long or as short as you wish but it could include: Invitations, Order of Service sheets, Table plan, Menus, Place cards, Napkins And it can be anything from formally traditional to contemporary, humorous or off-the-wall funky. True traditionalists will choose simple stationery with no illustrations, though an enormous range of designs is available – or you can even make your own. Think carefully before you go for this option, however, it’s fabulously personal but it can also be incredibly time-consuming. And if you want something out of the ordinary, there are stationery designers who will hand-make everything in a design exclusive to you. Spend time choosing your stationery. It should set the scene for your wedding and reflect its style. And whatever you choose, do insist on good quality card. You’re spending a small fortune on your wedding, and you want your stationery to show what an important event it is. Make your stationery an early priority. 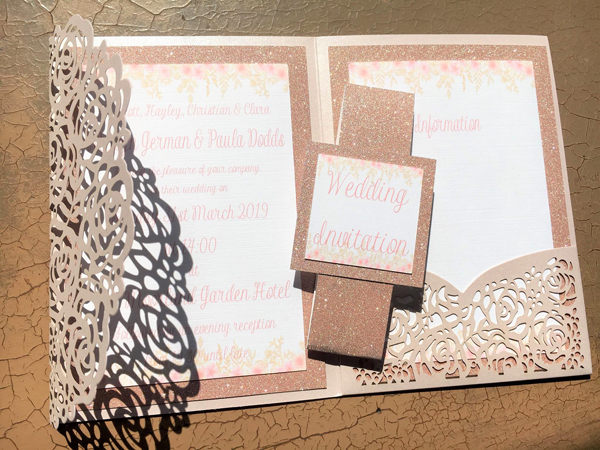 It isn’t unusual for invitations to be sent out three months before the wedding and you need to allow time for them to be printed. Order your stationery at least six months before the wedding – longer if you are having it hand-made. Bespoke wedding and events stationery, hand made to order is the speciality of Plymouth-based PMGD Cutz. They aim to create simple, cost effective wedding stationery and table decor that won’t break the bank but will still look wonderful.